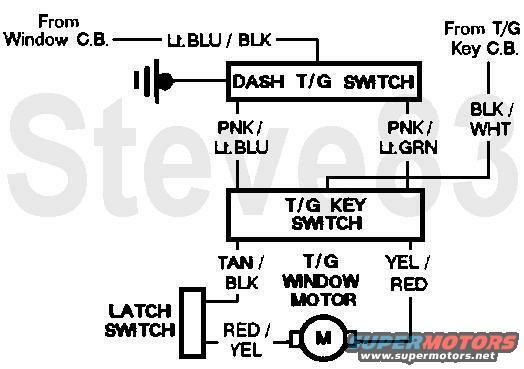 The Bronco tailgate window circuit is a common (Ford) polarity-reversing circuit with 2 switches. Each switch has its own power feed; the dash switch through the ignition switch (key-on only) and the tailgate key switch from the battery (always hot). The dash switch normally holds both motor wires to ground, and the key switch normally holds the motor wires to the dash switch wires. When either is operated, it sends one of the wires hot, powering the motor (assuming the latch switch is closed). When operated the other way, the polarity is reversed, reversing the motor's direction. Neither switch is a "master" because neither will work if the other is disconnected OR in the opposite position. To add a simple self-diagnostic capability, wire a 12V lamp across the latch safety switch terminals, and mount it in the tailgate shell above the lock cylinder in the inside sill (through a carpet retainer hole if present). If either control switch is activated, and the only thing preventing the glass from moving is the safety switch, the lamp will light and be visible to a person using either switch.